Hyundai offers one of the widest ranges of vehicles to choose from: A-segment models for urban mobility, to D-segment highway cruisers and multi-purpose commercial vehicles. Every model of the European range is designed, engineered and built to suit every fleet need. Versatile and economic cars across every key sector provide the best experience for drivers as well as passengers. With more than 2.000 dealerships across Europe and an expanding network of Fleet Business Centres, Hyundai will always be by your side. Rigorously-developed European vehicles, attractive finance packages and outstanding service are the cornerstones of Hyundai’s efforts to deliver world-best customer service at every touch point. Modern production facilities, universally recognised quality standards and processes, and highly skilled staff combine to create vehicles of the highest quality for customers. The quality of the cars has been recognised by media and manufacturers alike, as well as by an increasing number of customers who choose Hyundai for personal and fleet transportation. 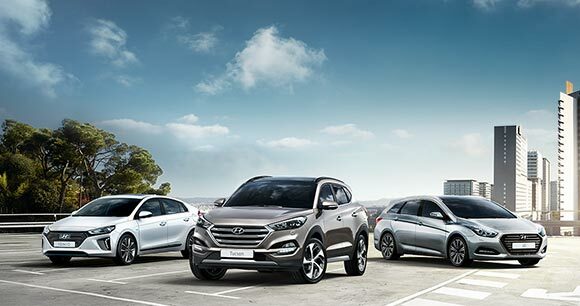 European vehicles Hyundai is so confident in the quality and reliability of its vehicles that a fully-transferable Five Year Unlimited Mileage Warranty* is standard across the entire passenger car range. Peace of mind is essential, that’s why customers also benefit from five years of roadside assistance and five years of free vehicle health checks. * Vehicles used for taxi or private hire uses are covered by a five-year, 100,000-kilometre warranty. Warranty cover excludes fair wear and tear.